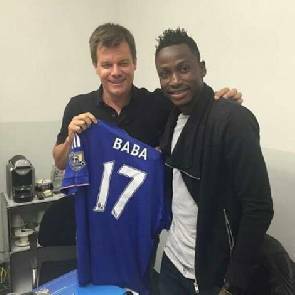 Ghana international Abdul Baba Rahman has formally joined English champions Chelsea, after the club announced his signing on their website on Sunday. The 21-year-old left-back joins from German Bundesliga club Augsburg. “Chelsea Football Club is delighted to announce we have reached an agreement with FC Augsburg for the transfer of Abdul Baba Rahman,” a statement on Chelsea website read. Rahman replaces Brazilian Filipe Luis, who was sold back to Atletico Madrid after just a season at Stamford Bridge, and he will be expected to deputise for, or fight for a starting place with, Spanish star Cesar Azpilicueta. The young defender made a name for himself in the Bundesliga after an impressive debut in the top-flight. He was an integral part of the Ghana team coached by former Chelsea boss, Avram Grant, that reached the final of the 2015 Nations Cup. “I am very happy to sign for Chelsea, one of the biggest clubs in the world, and I can’t wait to train with my new team-mates and very much looking forward to working with them and Mr Mourinho,” Rahman told the website.